In the coming days and weeks, you’ll see more and more passive sharing on Facebook through the Ticker. It is also certain that Facebook users will be frustrated, confused and angry as a result. 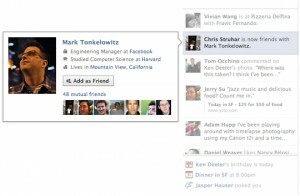 There is a simple way that Facebook can avoid this… if they so choose. Do you know what you're passively sharing to your friends' Tickers? In the past, you’ve had to click a “Share” button and go through the steps of approving every post to your Facebook wall. You actively and consciously shared your content to Facebook. As a result, you shared less. Now, when you first add a Facebook application, you click “Add to Timeline.” This way, it will passively share all of your activity to the Tickers of your friends (as you determine in your privacy settings). As a result, you will share more. Let’s use Spotify as an example because you’ve likely already seen updates from your friends with this application. Spotify is a music service. It allows you to listen to your own music as well as friends’ music. 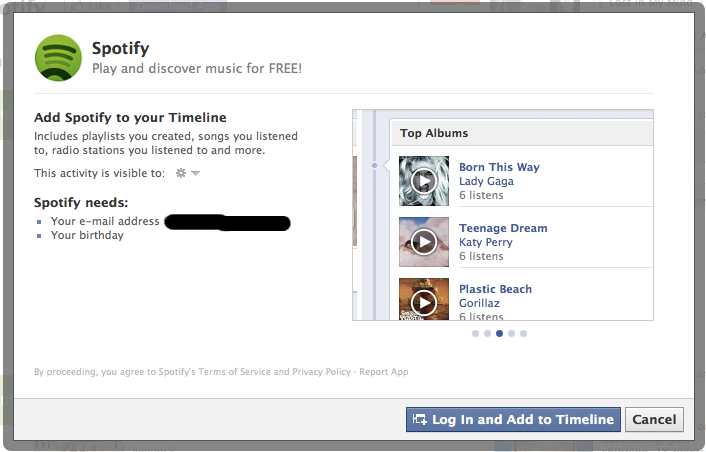 Spotify integrates with Facebook so that you can share the music you are listening to with specific groups of friends. When you click add Spotify to your timeline, you'll share all of the music you listen to. Sharing the music you’re listening to — or knowing what your friends are listening to — may or may not be useful to you. But also consider the other possibilities: Know what your friends are reading, watching, cooking, etc. This could be useful in certain circumstances in terms of discovering new things. The problem is that since passive sharing is new, most Facebook users don’t realize what it is they are sharing (which is everything). It’s been common that a friend will go days sharing every song that is being played on their computer without realizing this information is being pumped to their friends (again, the group of friends they designated when they added the app — or the default group to whom they share). While the potential for disaster is limited with Spotify, there is certainly an opportunity for embarrassment. And it probably wouldn’t help if your boss is on your friends list that receives the updates of the songs you’re listening to (and you shouldn’t be Facebook friends with your boss in the first place, but that’s another story). Or co-workers. And also realize that when you listen to a friend’s playlist, songs will come up that you don’t “intend” to listen to, but they still go into your friends’ tickers. So… worst case here. You’re listening to music on work time — which shouldn’t be a big deal at most jobs. You’re listening to a friend’s “Top 100” playlist that has mainly been Marvin Gaye, James Brown and Al Green — all awesome and respectable music. Suddenly, that friend slips in some 2 Live Crew. You get the potential. It shows up in your friends’ tickers. It may reflect poorly on you, particularly if you don’t filter your friends appropriately. Of course, this is just with music. Think of the possibilities here for what you’re reading, watching, etc. It could get hairy. The thing is, the true problem isn’t necessarily that the information is being shared. It’s that users often don’t know — or forget — that the information is being shared. When that happens, nothing is done to prevent such an embarrassing situation from happening. I’m not going to ask for a drastic solution, like eliminating passive sharing. I get that there is some really cool potential here. But Facebook can make one very simple change that will prevent a lot of headaches: Put your own activity into your own Ticker. I don’t understand why they don’t do this. I get my own activity in my News Feed. Much of the confusion and anger about the Ticker is misguided because people assume they are sharing stuff they don’t want to share through the Ticker because they see information that isn’t protected by others showing up. In reality, so many problems can be solved simply by putting my own activity in my Ticker. This way, what I’m passively sharing is always clear. It’s never a mystery. And when there’s clarity, acceptance is more likely to follow. Once you know what you are sharing, you can react quickly. It encourages me to check my privacy settings for that app. It reminds me to be careful what I am listening to/watching/reading with that app. And if I’m not comfortable with what I’m sharing, I can always disconnect that app from Facebook. Oh, and one more thing… Allow me to delete individual items when they show up in the Ticker. While I agreed to passively share, I should have the ability to delete something that I don’t think accurately reflects my interests. So, I guess that’s two changes. But one big one and one small one: 1) Let me see what I am passively sharing in my own Ticker, and 2) Let me delete individual items that I have passively shared so they are removed from Tickers.